On graduation day, when life's journey seems uncertain, it's nice to know that God has the path clearly planned. That's the underlying theme of "God's Promises(R) Are Great for Graduates!" 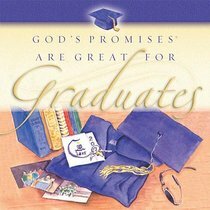 This collection of Scripture promises and inspirational quotes, carefully selected for the graduate, are complimented by original illustrations created for this book. There's also a page to write a personal promise from you to the graduate. ^Since 1982, "God's Promises(R)" has reached over 11,000,000 people, making it one of the most popular brands in Christian publishing. "God's Promises(R) Are Great For Graduates!" is a unique and timely addition to this brand. A great gift for any graduate, this gift book will be treasured for years to come. About "God's Promises Are Great For Graduates"